Codementor Support - How do I refund a user? All Categories ​>​ I&apos;m a Mentor ​>​ Mentor Basics ​>​ How do I refund a user? 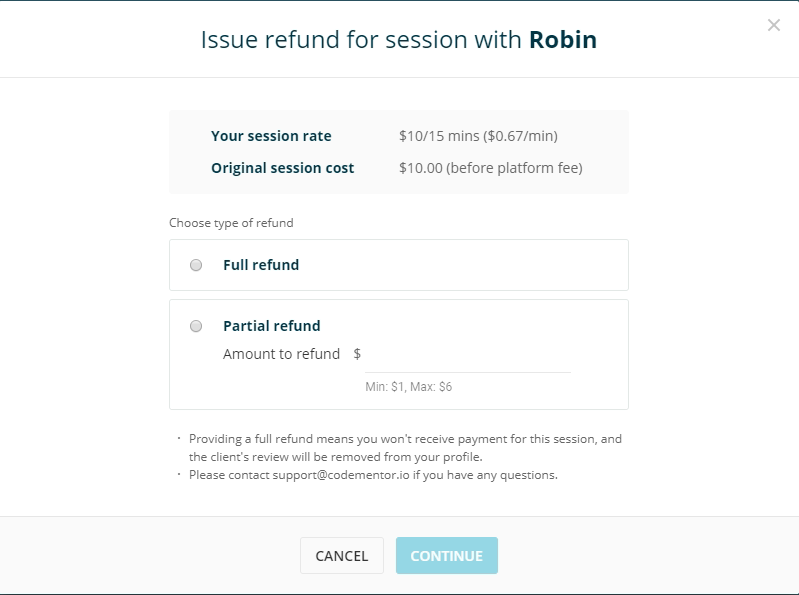 To issue a refund for a live session, please go to your Session History page, click on the session you'd like to refund, and then click on "ISSUE REFUND" button. After clicking, a refund modal will pop out. From there, you can choose full or partial refund for the session. After selecting full refund or entering an amount for partial refund, click continue to process the refund. Issue refund is also available on the invoice page after a session. To issue a partial/full refund for a freelance job, please go to your freelance jobs page, click on the freelance job you'd like to refund, and then click "REFUND" so we can get that processed for you. Please note that freelance job can only be refunded by mentors when it's in "Pending Review".